Way back in February, Leslie Davol blogged for the Center for the Future of Museums about the Uni Project, a portable reading room she founded and runs. This blog post contributed to our thinking about the potential portable, flexible, and adaptable models present for museums interested in connecting to broader segments of their local communities. As Leslie wrote for the Center for the Future of Museums: “The future of museums can include public space, even outdoor public space. A commitment to bring museum programs to plazas, parks, town squares, and even farmers markets and malls—the places where we already gather—will benefit our culture, our cities, and museums themselves.” We believe this approach provides a great opportunity for increasing access to museum resources. We interviewed Leslie to learn more about the Uni and how this concept might further connect to museums. Incluseum: In what ways have you collaborated with museums and envision future connections? Leslie: The Uni Project uses a portable reading room to bring books and learning experiences to public spaces. 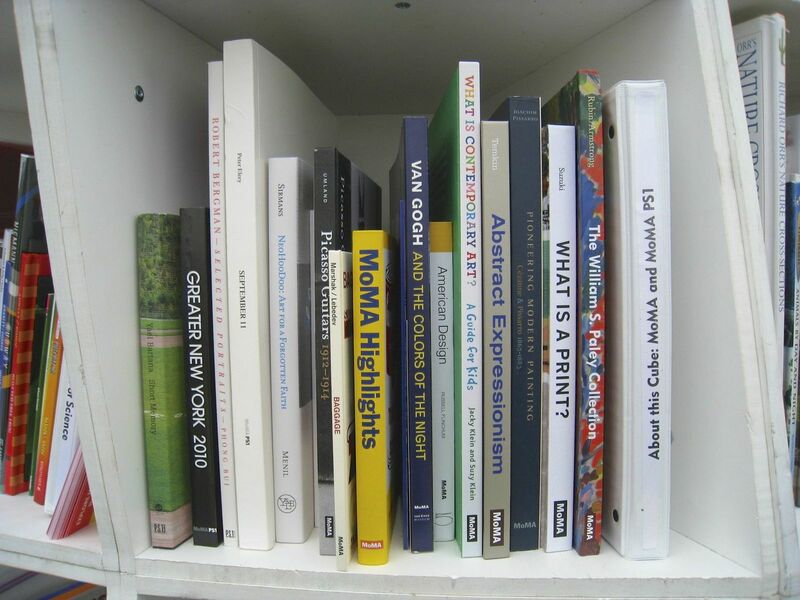 We rely on books donated by individuals and organized by librarians, and we also work with museums to curate “cubes” of books and activities that travel with us. One of our goals: encourage museums to create exhibits and also hold some of their programs in neighborhoods with us, just as they sometimes do in schools. Cube curated by the Museum of Modern Art. Photo courtesy: Leslie Davol. Incluseum: Have there been contrasting experiences when you set up Uni in different neighborhoods? Leslie: At its core, the Uni reading room experience is fairly consistent every time we go out. So it serves as an interesting experiment as we move between New York City’s varied neighborhoods. In some places, the kids are all over the books, and in others kids are more drawn to the microscope or activities. The number of people who stop and the length of time they linger also varies. We learn more about these difference each time we go out. We created a modular library so that it can be customized to different locations, but we don’t go overboard with customization and usually just aim for a good mix of content. In fact, we try to resist predicting or assuming exactly what people will want in a given location. Ideally, the Uni will encourage people to encounter things they might not otherwise encounter. Incluseum: Do you see children, adults, families or youth interacting with Uni more frequently? And was this part of your intention? Leslie: On a good day, we’ve got adults reading picture books that they remember from childhood, and the occasional ten-year-old browsing a comparative study of cities. Our goal is to offer a multi-generational reading room, where books and activities can be picked up by any age group. Our tangram puzzles are solved as often by kids as adults. It’s remarkable how kids immediately know what to do: they approach readily and start reading, without asking whether certain books are intended for them. Adults tend to ask questions first. Once the Uni is set up and crowded with people of all ages, however, it’s pretty clear that all are invited to join in. 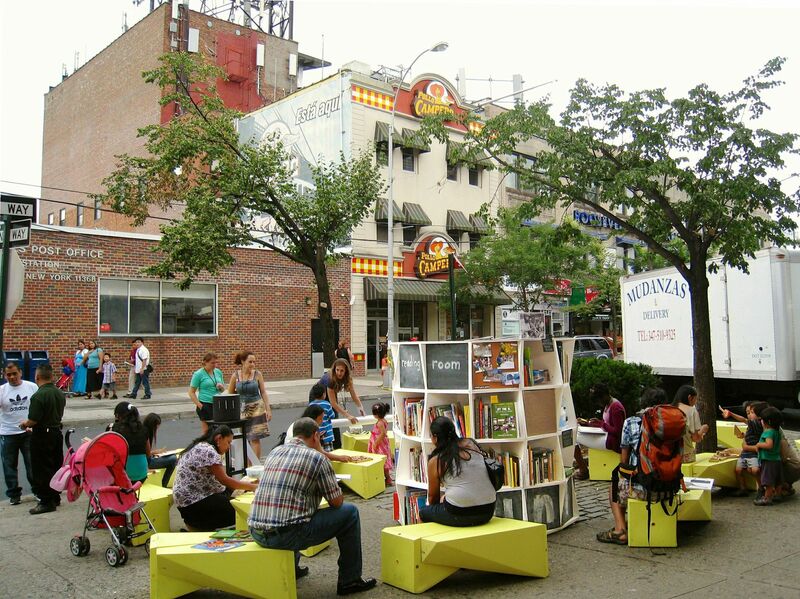 People interacting with the portable reading room in Corona, Queens in July 2012. Photo courtesy: Leslie Davol. Incluseum: In what ways do you feel you meet a need or provide a service or experience currently not available at libraries or museums? Leslie: Museums and libraries invite community into their space. The Uni allows communities to invite the museum and libraries into theirs. We don’t offer anything that isn’t already done inside these institutions—we just make things portable, so learning experiences can be deployed outside the walls. When you offer something outside in public space, your audience is what we call a “walk-up” audience. But that walk-up audience can just as easily walk away. People haven’t paid an entrance fee and haven’t committed to spend the day with you, so you can’t assume they are going to stay a minute longer than you are engaging them. 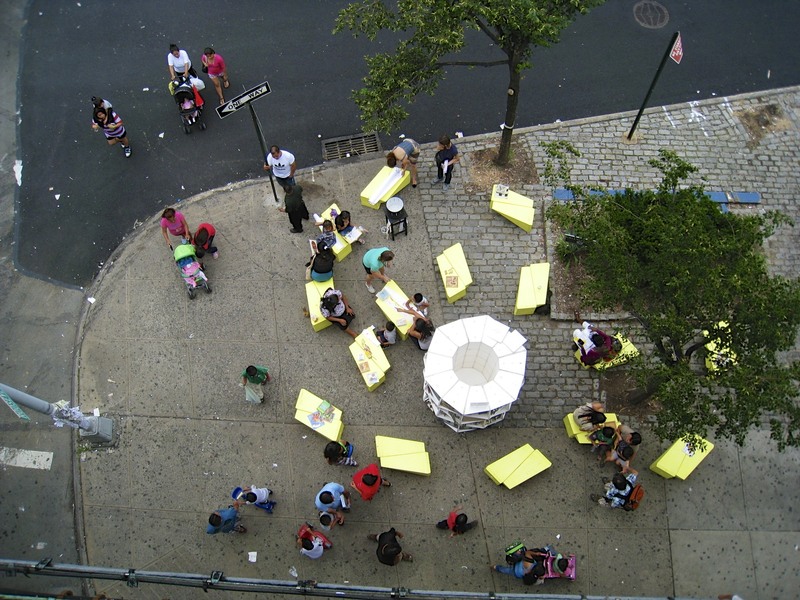 We often find ourselves saying: “everything changes when you do it in public space.” When you take on the responsibility of programming the physical center of the community—for example a busy plaza or a town square—you make a statement. In our case, we’re saying that books and learning should be center stage in our city and a priority for our society. We think at this moment people have a deep need to be together and gather around these values. In another era, there might have been a statue of a king or war hero on the plaza. For now, we’re erecting a temporary reading room. Incluseum: How do you go about deciding where to set up the reading room? Leslie: The Uni is a test kitchen for learning experiences in public space. We choose our locations with two principles in mind: serve communities that are trying to improve their own neighborhood; and challenge ourselves so that the Uni Project improves over time. It will take years before we begin to run our of places to do both those things in a city like New York. We now have a waiting list of communities that are asking the Uni to come. We’ve also pinpointed several locations where we’re returning repeatedly, which will give us some longitudinal data about how we’re doing. Incluseum: What kinds of questions do users of the Uni ask you about the project? What are they curious about? Do many of them feel invited to walk right up and use it without knowing your intention? Incluseum: What have been the pros and cons of your model? Pros: The Uni takes the things we love about our favorite institutions and make them portable. When you make learning portable, you can be tactical, and that opens up all sorts of opportunities for supporting people, strengthening communities, and improving public space. Cons: We are working weekends all summer long! And parking a truck in New York City is tricky. Uni at Corona Plaza, Queens, NY, 2012. Photo courtesy: Leslie Davol. Incluseum: What are the main lessons you’ve learned about what works and what doesn’t (in view of accomplishing your goals)? Leslie: In public space, your audience is not captive. You’ve got to earn every interaction. Furthermore, it’s like hiking: you’ve got to bring everything to the campsite on your back. So, you get good at packing just what you need to get the job done. Things that work: bold clear signage. solving people’s physical needs (shade, place to sit); creating walk-up experiences that allow people to be together but not necessarily interact. Things that don’t work: trying to do too much at once. Trying to get people to come to events at a specific time instead of walk-up. Reading outside in the cold or rain! Incluseum: How can experimental projects like Uni inspire libraries and museums to connect in different ways with local communities? Leslie: Get out and try something new. Document it. In our case, this has led to a new step: we’re providing libraries and other nonprofits with Uni structures so they can go out on their own. Incluseum: Do you have any final advice for traditional museums and libraries? Leslie: Copy us, or if you are in NYC, partner with us! Leslie Davol founded and runs the Uni Project with her husband Sam. She has worked for several New York City museums, and has also worked on museum planning at the World Trade Center site. She has a M.A. in American Studies from George Washington University. http://earlylearning.org/outreach/outreach/) that features 30 hands-on science activities in addition to books. It’s been an exciting learning curve to see what works and what doesn’t in this portable model. A longer write-up about the Seattle UNI will be on Paul Orselli’s blog in the near future (http://blog.orselli.net/).